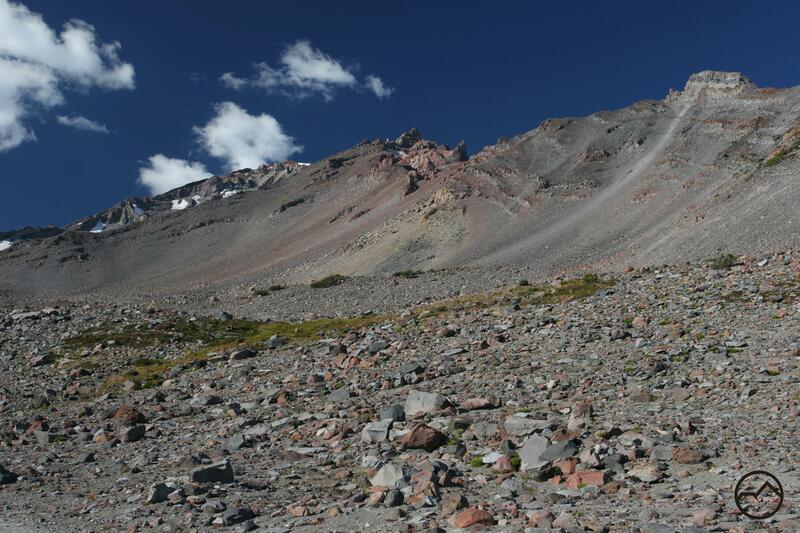 An easily accessed trail that explores the site of Mount Shasta’s first ski resort of which little remains. 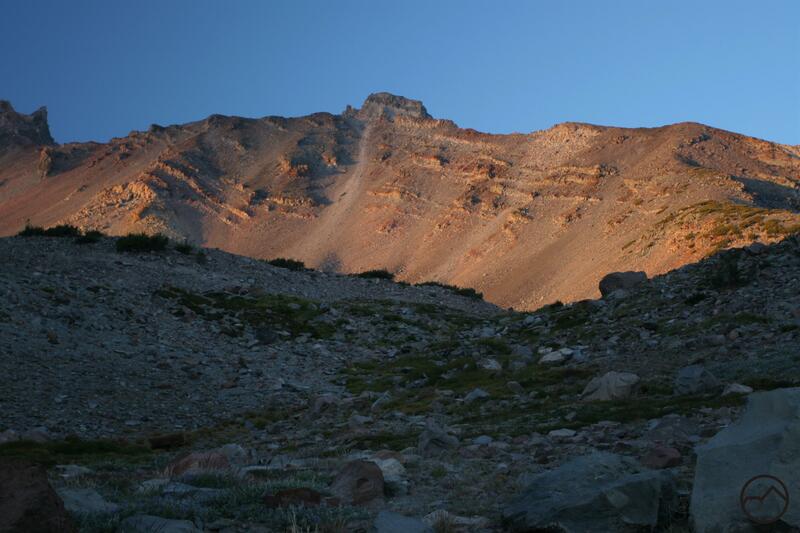 The trail is almost entirely above treeline and passes through hidden valleys high on the mountain’s flanks. Sunset in the Old Ski Bowl. 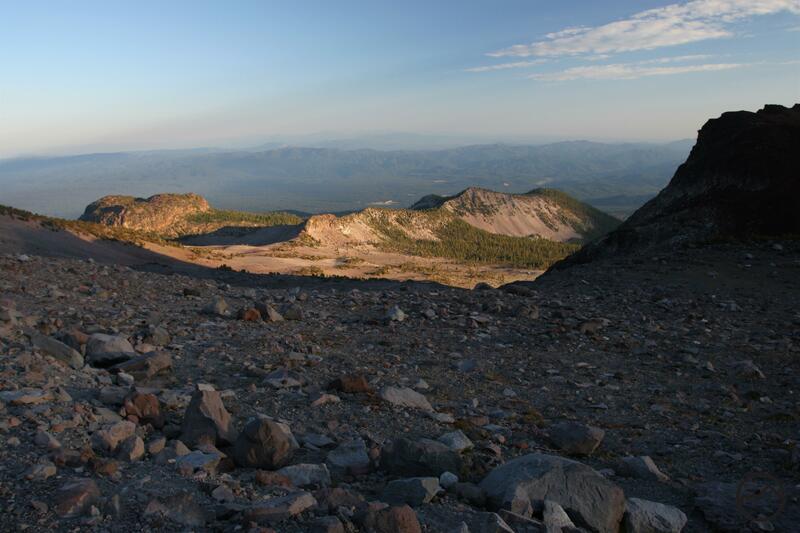 Mount Shasta’s Old Ski Bowl Trail is easily the most unusual trail on the mountain. Most of the other trails lead to specific destinations, are simple out and back affairs, and are high on scenery, not on history. The Old Ski Bowl Trail foregoes each of these expectations. That is not to say that it lacks scenery, on the contrary, it climbs high up on the mountain, offering great views of some Mount Shasta’s craggiest terrain, as well as excellent vistas to the south of the McCloud area, the Sacramento River Canyon and the Castle Crags. Yes this trail does offer the opportunity to visit some of the mountain’s bygone days, namely, as the name implies, the remnants of the ski park that used to occupy what is now referred to as the Old Ski Bowl. Skiing existed in this park from the mid 50’s until 1978, when an avalanche wiped out several of the chairlift towers. Indeed, the ski park is the reason that there is a trail in the Old Ski Bowl, as well as a paved road leading all the way to the trailhead, a rarity on Mount Shasta. The trail itself was originally constructed as a service road that led all the way to the top of the chairlift and a radio tower installation shortly beyond. 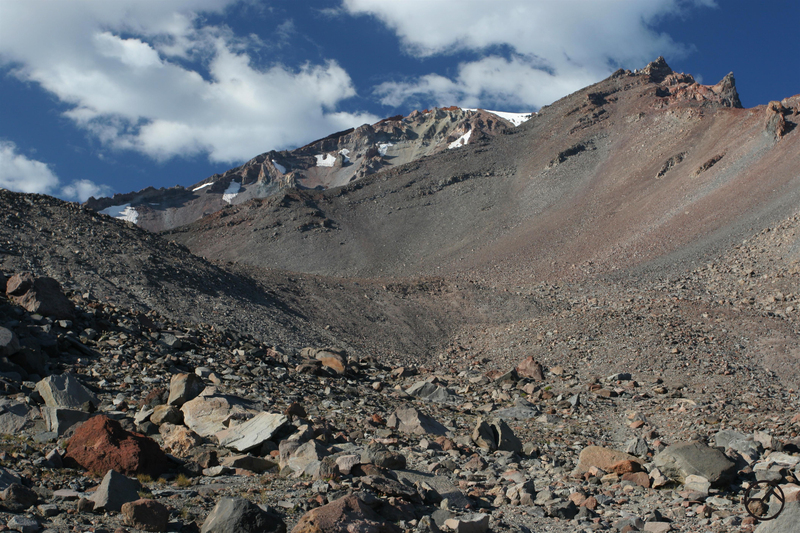 The old road is has decayed since the park’s closure and is now nothing more than a wide trail running across the ubiquitous scree that fills the bowl. The summit of Mount Shasta peers out from behind the upper reaches of the Old Ski Bowl. The trail itself offers up a smorgasbord sights. 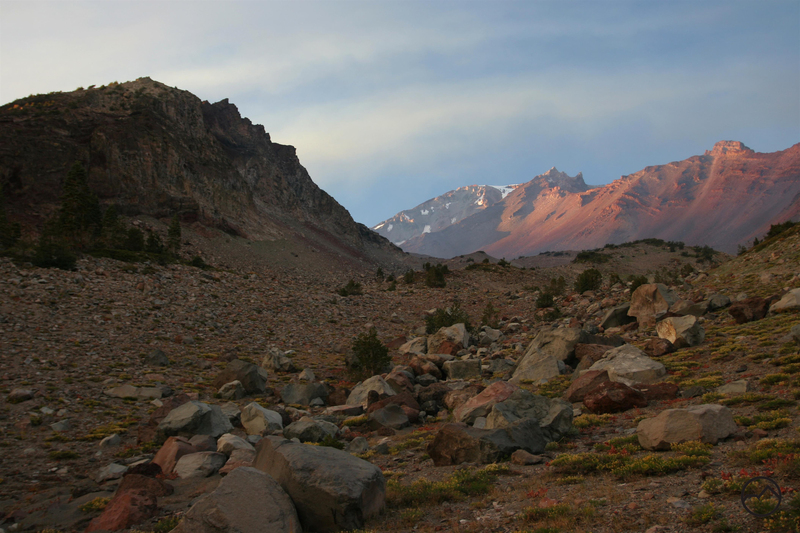 The trailhead alone offers spectacular views of the Trinity Divide and of looming Mount Shasta. Many people drive to the trailhead to picnic, enjoy the view and watch the sunset. Indeed, far more partake of these pleasures than hit the Old Ski Bowl Trail, which leaves the trail relatively lightly used, considering how many people frequent the trailhead. 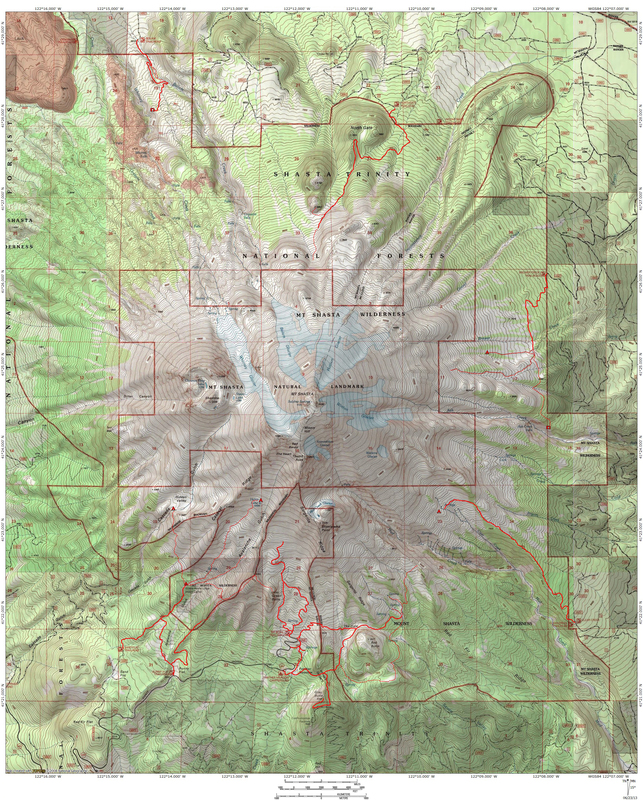 Aside from the ever present bulk of Mount Shasta floating high overhead, Shastarama Point, Green Butte, Red Butte and Gray Butte are all fixtures on this trail. For those that enjoy more subtle beauty, a less travelled section of the Old Ski Bowl Trail passes a lovely spring that sustains a small meadow in the midst of the dry talus that composes most of the area. Taking the small with the grand, this trail offers many excellent features to those who journey beyond the spectacular trailhead. 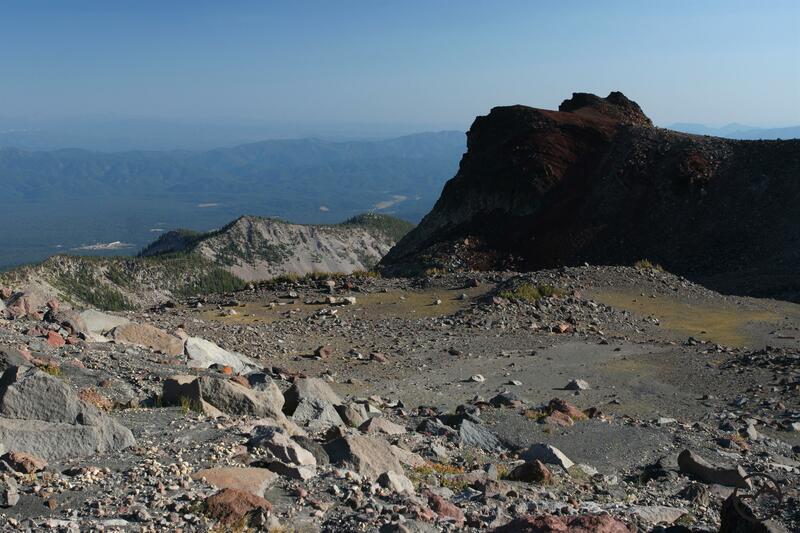 For those seeking higher adventures, the Old Ski Bowl Trail can also be used to reach the summit of Green Butte or to access Greed Butte Ridge, a route that leads to the top of Mount Shasta. Looking up into the Old Ski Bowl. The Old Ski Bowl Trail begins only feet away from the parking lot at the end of Everett Memorial Highway. The trailhead is close to treeline, so the area is sparsely wooded and the views are spectacular. This is a popular destination for many locals and visitors to drive up to and enjoy the alpine scenery. The trailhead also functions as the beginning of the Squaw/Southgate Meadow Trail, though this trail has a distinct point of departure separate from the Old Ski Bowl Trail. Initially, the trail is wide and sandy as it sets out to the north, toward the Old Ski Bowl and Mount Shasta. The entirety of the Bowl spreads out before the trailhead, so whole route is essentially visible from the beginning. Looking north toward the mountain, four notable landmarks can be identified from the outset. First, on the left is the sheer wall of Green Butte. This is the highest of the five color themed buttes that surround Mount Shasta. Next, on the far right is the massive turret of Shastarama Point. Moving left from there, the craggy cluster of spires topped by Thumb Rock are higher and foreboding. On the horizon between all these landmarks is the serrated crest of Casaval Ridge climbing inexorably toward the top of Mount Shasta (which is not visible at any point on this trail). Taking all these reference points in, the trail sets out toward the mountain. Mount Shasta rises above a seep in the Old Ski Bowl. The sandy terrain lasts for 100 yards or so before the trail begins to get rocky. Once the rocky area is reached, this will be the nature of the trail for the duration. The path is wide throughout, indicative of its former status as a road. Almost immediately a wide trail splits off to the left of the main trail. This is the west side of the Old Ski Bowl Trail’s loop rejoining the main path. Continue straight on the primary trail, which soon begins to angle to the east. Around 0.3 miles from the trailhead, another prominent use trail will branch off to the right. This is a connecter trail heading over to the Squaw/Southgate Meadow Trail at Hummingbird Saddle. Stay on the main trail is it makes a wide arc to the east side of the Old Ski Bowl before making a turn and begins to traverse back across the entire width of the Bowl. Although the trail is wide like a roadbed, an obvious single track has been worn in. As the trail climbs steadily along the traverse across the bowl, it passes a seep that sustains a small, lush grassy area above the trail. Although there is no running water, it is a refreshing respite from the barren and rocky terrain. As the trail nears the west side of the bowl, there are a few use trails descending to the south. Avoid these, as they just link up to the western trail that is the descent leg of the trail. Finally, the trail round a small corner to a bench near the base of Green Butte. Here the trail connects to the western leg of the loop. This will be the route of return. This spot alone is a fine destination for those who want to skip the climb to the higher reaches of the Old Ski Bowl. From here, Green Butte towers overhead and the view south is great. Red Butte and Gray Butte are both visible, as is most of the trail and the parking area. Far to the south are the Sacramento River Canyon, the Castle Crags and the awesome Grey Rocks. The hidden bench behind Green Butte. From the intersection of the two trails, the Old Ski Bowl Trail proceeds north. While the main trail is obvious, there are several use trails spreading out in other directions and still more running parallel to the main route. All of these are viable options but the main trail avoids potential route finding. That said, some of the use trails are good routes for the ascent, since the junctions with the main trail are more obvious on the ascent. On the way down, the main Old Ski Bowl Trail is the better option. As the trail moves to the north, a hidden bowl opens up to the west, on the north side of Green Butte. From the trailhead, it seems one must simply hike high enough into the bowl to be able to climb Green Butte. Once this high, it is apparent that this is not the case. It is possible to climb Green Butte from here, but it requires an off trail route through the aforementioned bowl and then a scramble up the steep talus on the north side of the peak. For those intent on doing so, this would be the point on the trail to deviate to the west and climb the butte. If one intends to continue on the Old Ski Bowl Trail, the main destination is the top of an obvious bluff directly ahead. The trail makes a sharp swing to the west and traverses the base of the bluff. The detritus of the old skiing operation makes its first major showing in this area, mostly in the form of some random concrete and huge wooden beams. On the west side of the bluff, the trail turns to the north again and rounds its way to the backside of the bluff, which is topped by a level plateau. The ruined chairlift terminal in the Old Ski Bowl. This is where one really gets a sense of what used to be here. Although the skiing outfit is now a mess of concrete, wooden beams, steel cable and rebar, it is obvious that a substantial structure once occupied this spot. This was the terminal of the chairlift that used to ferry skiers to the top of the run and begin the 1,400 foot descent down to the base of the slopes. With Green Butte nearby and Casaval Ridge, Thumb Rock and Shastarama Point all looming overhead, it was obviously a spectacular setting for a ski park. 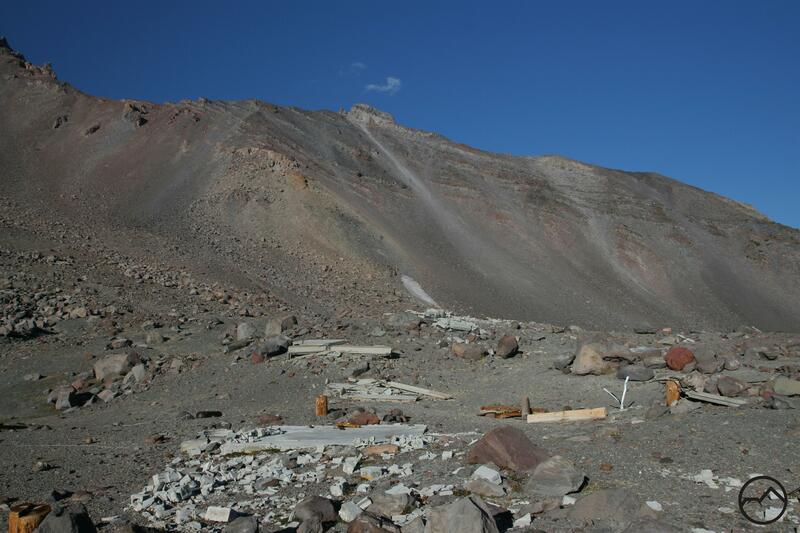 Still, the accouterments that accompany such an operation would have scarred the landscape and when one has hiked up here, it may be cause for appreciation that the current Mount Shasta Ski Park is located lower on the mountain. Interestingly, a small cluster of krummholz whitebark pine clings to the rim of the plateau, also marking the highest trees in the Old Ski Bowl. To reach Green Butte Ridge, the best place to divert off the main trail is right on the backside of the ruins of the chairlift. Here one must work over to the base of the ridge and again scramble up the steep talus. An obvious low notch on the ridge should be the destination. The main trail continues beyond this point for another 0.25 miles, passing the remains of an old radio tower. This is the end of the old roadbed the trail has been following from the outset. Beyond this point a use trail climbs up into the vast talus slope below Thumb Rock. Sunset bathed Shastarama Point, high above the Old Ski Bowl spring. On the return, head back to the junction of the main route and the western trail. Some parts of the western trail do look wide enough to be an old road, but for the most part, it consists of an obvious use trail worn into the side of the mountain. Skirting along the base of Green Butte, it offers more great vistas. Also, this side of the trail tends to get a bit less usage, and beneath the cliffs of the butte, it has a lonely quality. About halfway down to the trailhead, the western trail reaches one of the prettiest spots on the whole hike. An old pipe stuck into the ground funnels a healthy flow of spring water, even late into the season. The water sustains a fair sized meadow amidst the desolate rocks and pumice of Mount Shasta. This is the only point on the entire hike that has running water and sound of the cascade that it forms is quite welcoming. The water does not last long, as it disappears into the thirsty soils of the mountain. This point marks the end of the meadow too. Beyond this point, it is a quick trip down to the trailhead. Sunset on the Old Ski Bowl trailhead. On I-5, take exit 738 for central Mount Shasta. Proceed east on Lake Street, through the intersection of Lake and Mount Shasta Boulevard. The road continues east and bends to the north, reaching an intersection by Mount Shasta High School. Pass through the intersection, which becomes Everitt Memeorial Highway. Stay on the highway for 14 miles to the end of the road, which terminates at the Old Ski Bowl Trailhead. All distances are round-trip. Just a heads up on the Old Ski Bowl though. The road is not open past Bunny Flat, so it is not possible to drive up to the Old Ski Bowl. Still a bit of snow up there. I understand what you mean about hiking with kids that age. My kids are 4.5 and 1.5. Fortunately, there are a bunch of really good trails that are suitable for that age. Feel free to shoot me any questions regarding suggestions! Plan One day hiking trip ..
1. to Shastarama pt – start from Old Ski Bowl head (if there is parking lot) . Question – is this workable ? Hello Wilson. It is hard for me to answer these questions. I have no idea what your experience and fitness levels are, let alone many other questions that would influence the advice I give for these particular queries. For example, no trails lead to Shastarama Point and while it is reachable, it is a very challenging trip suitable only for those in great condition, significant route finding experience, and a good sense of the dangers of traveling on both snow and over loose scree in difficult conditions. In short, this is not a trip for most people. Frankly it does not inspire a lot of confidence that you are prepared for the kind of adventures you are suggesting if you are not even aware of which trailheads and parking areas lead to what. I don’t say that to be critical but to be realistic and help you avoid a miserable and potentially dangerous experience. If you have any other questions about possible hikes or other things you might do in this area, I would be happy to help. Due to I can’t find any friends (Taiwan) who own the experience visit Shasta Mt area .. I found elsewhere that dogs are allowed here (unlike the rest of shasta). Can anyone verify? This is the case. 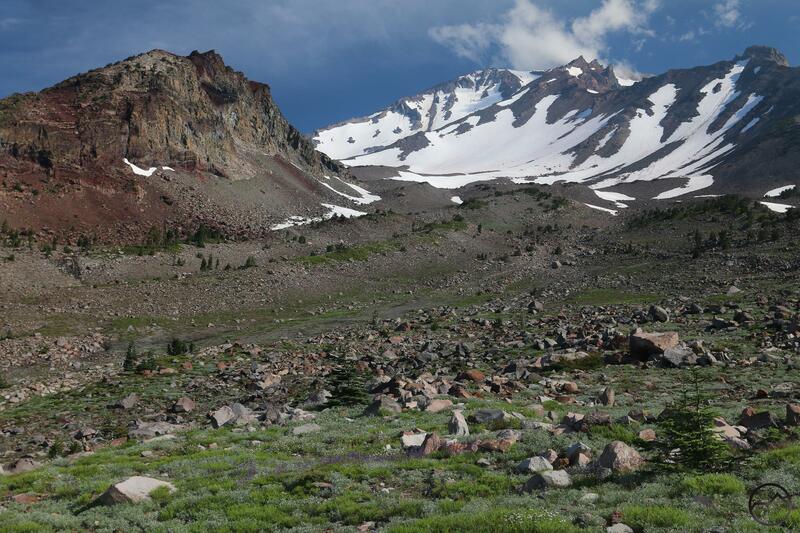 Panther Meadow is verboten as a special preserve area and dogs are forbidden in the Mount Shasta Wilderness, which covers pretty much every other trail on Mount Shasta except the Old Ski Bowl, which is outside the wilderness area. Hi, We are planning a trip for Sept 2018 with a large group of hikers at various levels. We bought several copies of your wonderful Book on Shasta to help plan three days of hiking. 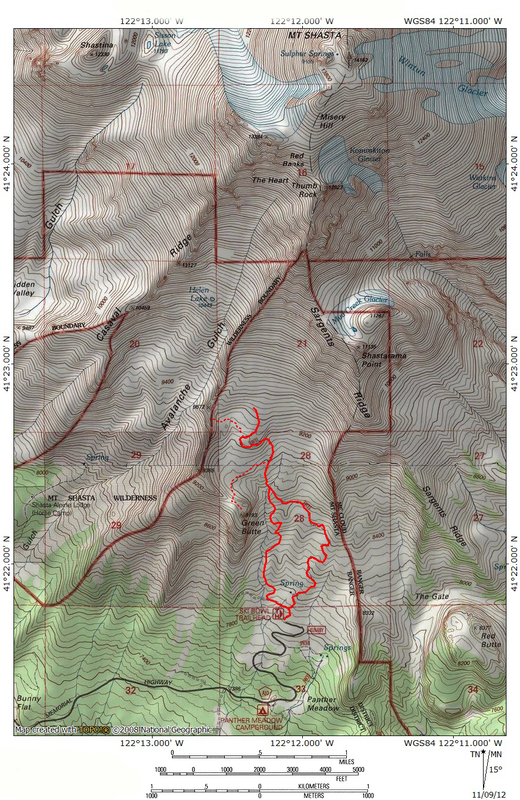 I like the idea of doing the full loop for the strong hikers of Old Ski Bowl & South Gate trail but come up with over 3,000 feet we like to keep it at 2,000 feet to 2,500 but sometimes do over 3,000 and 12- 18 miles. Just wondering what the elevations are for the lollipop sticks for the Old Ski Bowl & South Gate and if we drop one stick which one?? I don’t have a good large map to help me calculate the elev. Also doing the Dome and PCT one day, and possibly the Sisson-Callahan trail or the Seven Lakes do you have another suggestion for strong hikers? Also have a group of ladies and we are trying to complete the PCT in Nor Ca, we have most done from Cottonwood/Kresarge Pass to Lassen, so excited to do some sections in Shasta and are using your book to plan some day hikes and a few overnights . So thanks for your great book !! !